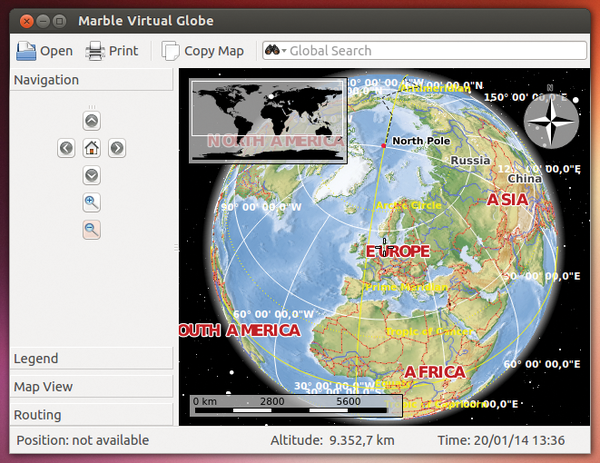 Marble is one of the educational programs of the KDE Software Collection; it is therefore in the repositories of all the major distributions. 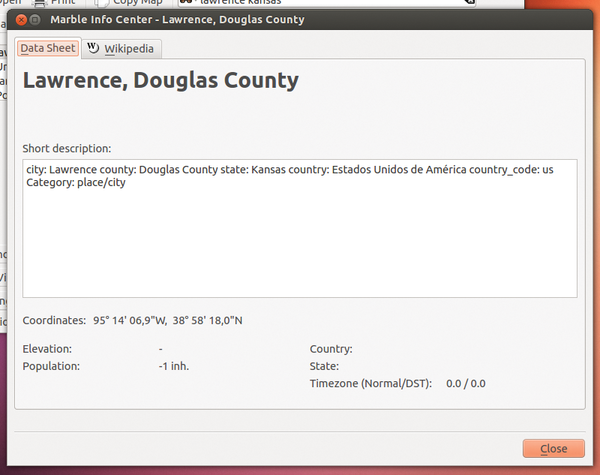 Many distros install the virtual globe by default, but not Ubuntu. Because Marble is a KDE program, during installation it will drag in a large amount of KDE libraries, adding up to nearly 100MB. Given the enormous size of modern hard disks and high-speed Internet connections, this is not really a problem, and it means you will also have these libraries installed if you want to use other KDE apps later. Although Marble looks somewhat unimpressive, it provides more than just a world globe. You can plan a trip inventory, set the altitude profile for a bike tour, or even fly over the moon. After startup, Marble shows the Earth image on the right side of the screen, as in Figure 1, with a universe of stars as its background. At the bottom right edge, you'll find the navigation bar. You already may be familiar with this from Google Maps. The arrows at the top are for rotating the globe. The plus and minus slider lets you zoom in and out. The scale ruler is at bottom left, and the Altitude in the bottom status bar shows the distance from Earth of the view. Figure 1: The Marble main window shows the globe and provides additional functions on the bottom left. Instead of the navigation bar, you can use your mouse. Moving the mouse across the globe image turns it into a hand pointer so that you can grab and rotate the globe. The mouse wheel lets you zoom in and out. Be careful how you wield the mouse; too much movement can start the ball rolling too fast. The middle of the screen shows a small white crosshair (which, depending on the background, can be hard to detect). Where the crosshair lands on Earth is shown on the stylized world map in the upper left, and the position appears as a white dot. Double-clicking another region of the world will quickly take you there. When you click a city or some other location, Marble displays a window with information about the geographic point (Figure 2) from the Geonames service . If the point appears beneath the compass or another element, you need to rotate the globe somewhat. Figure 2: Information in this window comes from the Geonames service. If the boxes for additional information bother you, click View | Info Boxes on and off to lock and unlock the info boxes. Or, you can drag-and-drop them to another place. To reach the navigation bar at the bottom right, you need to move the pointer to the edge, where it turns into a hand. You can toggle the crosshair display with View | Crosshairs . The background stars are not just window dressing but are a true representation of the night sky. If you wish, you can turn them off with View | Stars . You can also deactivate the simulated surrounding atmosphere with View | Atmosphere , which appears as a halo around the globe in Figure 1. Gesundheit! : KDE 4.3.4 Code-Named "Cold"
The KDE Software Compilation 4.3.4 release freezes the features for the upcoming 4.4, hence the code-name. QupZilla is a new Linux web browser that enters in an already crowded arena. But, QupZilla holds its own when it comes to speed and ergonomics. What shines in the dark is often hidden by clouds. Stellarium provides a clear view of the stars plus a lot of astronomical data.